Rossana invites Livino over to spar, learn more about each other, and prepare to plan for their wedding. The courtyard sees Rossana gearing up into her sparring leathers once again. She is almost fully dressed in fact as she adjusts the leather vest carefully. Turning about she keeps glancing hopefully towards the enterance. The servant helping her ready is trying hard to not smile broadly at the frequent glances. Messages between the two are carefully watched, to make sure that the pair have not broken any unspoken bonds that are developing between them. When Rossana suggested that he visit again in the evening, he had expected another quiet walk in the gardens and perhaps some more hand-holding. And more kisses. Those were especially nice from her. Instead as he arrives, he sees the young woman preparing her leathers, and he pauses at the edge of the plaza. In his hands, instead of his weapons or leathers, the young man instead holds.. a small bundle of peonias. After all, she may be a cavalieri, but she is the woman he is marry - and he wants to do his part to make her feel desired. Because in a way - she is. "I'm afraid that I have not had combat garb in a very long time, Signoria." he offers quietly, even without a sword. Rossana's eyes light up in excitement and she smiles brightly when she sees him come through the gate. Turning from the servants she makes her way, stride long and strong, to meet him halfway. Of course she looks at the flowers and her face softens as she reaches to take them carefully. An odd sight for his fine, though well-worked hands, to be giving flowers to hands garbed in combat leather. They are brought to her nose and she inhales deeply and her eyes close briefly. "Thank you, Signore. It's all right. We have a few spare suits that might fit you and a sword. Or we can not if you like? Just…we were told to get to know one another and I thought…was it a silly thought?" She glances back at the training gear worriedly. The flowers are gently held against her chest as she gnaws her lower lip. "No no, I thought it was a good idea.." Livino is quick to blush and his boot digs into the dirt with his toe as he lifts his gaze back up to the woman. "I just thought that you are a cavaleri, but I am drawn to the signoria that is beneath the leather.. and wanted her to be appreciated." he admits quietly, before he nods. "I will go change, and provide you with comedy this evening, then." Rossana blushes a soft pink and brings the flowers up to her nose once more. "You are quite sweet, thank you," She says and turns to lead him over to where everything seems to be set up. Some smart servant has already brought a vase and water for the peonies. The young woman sets them in and adjusts them a bit as Livino gets ready. She glances over at him shyly once and then back to the flowers. "I won't make fun. I'm not that kind of fighter. At least not until someone is as good as I am," She says as she bends to breathe in their scent once more. "Believe me, my betrothed, I will be laughing heartily at my own flailings. I fear that your husband is not a man of martial action." Livino points out as he slips behind some brush to slip in the leather and save her the scandal of peeking at him too much. After all such shows are to be saved for their wedding evening, no? "I told you that I broke my nose in spar similar to this?" Rossana gives Livino his privacy as picks up a glass of wine she had already poured before his arrival. "Would you like some wine?" She asks, pouring him some anyway. It's the polite thing to do. There may even be a little covered tray for afterwards with nibbly foods to eat. When he steps out in the leather that mostly fits she smiles. "I know. That's okay. I will try to keep you from breaking your nose. I made sure you have a faceless helm with mesh instead, see?" And she tosses it to him. "Actually, most of the training helms are like that," She admits as she pulls her own on. "A challenge for you," And she turns and plucks one peony from the vase and tucks it into the end of her gauntlet. "Get the flower and I shall give you…a kiss," That is a fair thing, especially with chaperones about to keep a modest and chaste eye on the two. "A challenge to ear a favor from you, Chevalieri? I will have to try more than I had considered." Livino offers back as he chuckles softly at her presentation of terms. Catching the helm, he moves to settle it in place. Though she had found the smallest male sized armor, on him, it still looks two sizes too big. Taking up the training blade, he considers and tilts his head. "And if I fail, what would you wish to claim, signoria?" Rossana taps her lips as she considers, walking out to the clearest part of the courtyard where all good sparring happens. "A miniature catapult that I can fling peas and sprouts at my cousin with," She tells him after a moment and with a bright grin that is somehow cheerful and mischevious. Blue eyes bright she salutes him with the blunted training sword. "Whenever you are ready, fidanzata," She replies with a certain sparkly in the blues. "I would have made you one if you had asked." Livino points out to her. Really, there's not much he'd not do for her. As she moves in on the attack, the lack of training on the sword is obvious for the engineer as he feels his helmet's hem neatly falls over his eyes as he takes a wide and ineffective swing at Rossana, leaving him wide open to her. Rossana lets him take the first swing and moves in quickly and easily to tap him across the shoulder. Yet she pulls back when she sees the helmet fall. "Hold. Let me help with that helmet," She says and comes forward. The sword is slid through her belt and her hands move to tilt his chin back slightly. Adjust it to where you can see comfortably and hold it there?" She asks him. Though her hands are gloved she is experienced in working with buckles and begins to adjust the strap beneath his skin. As she approaches, Livino straightens and may even stiffen a bit as he feels his betrothed's hands on helping him adjust. There's a good-natured smile offered to her as he meets her eyes and her smile spawns his own. "..I warned you that I was no warrior - it will be on you to protect our family." he offers to her quietly. "It will be mine to build a home that will not require you to do such." Rossana gets the helmet adjusted with a smile that turns gentle. "You're enough of one, I think, to count. We'll both protect and build…togther" She says quietly as her cheeks darken a touch more. Dropping her hands she peers at the helmet and then says, "Wiggle your head about forcefully. See if I need to go another notch? I don't want to choke your though…" The blue eyes sparkle a bit behind the mesh visor. "I thought choking was later." It's a little crass when he says it, and doesn't come out as he meant as he was trying to tease Rossana. Livino gives a solid shake of his head before he steps back and prepares his sword. And his cheeks are possibly bright red as he realizes suddenly what he may have meant by what he said. He was just about to apologize to her, when Rossana speaks up, and now it's Livino's turn to stammer. That was not fair to plant in his head. "..I-I.. ah.. uh.." he swallows hard. "…never considered?" It's managed as she gets the opening that she was looking for with her comment and strikes along the side of the engineer, causing him to give a small yelp. However, it is his blade that is touching against her heart in what would be considered a killing blow before the two part ways to prepare for the next round. Rossana did perhaps take unfair advantage of her betrothed in his moment of gawking. Yet she pays for it in turn and finds his blades tapping the leather over her heart. "Well done," She says in obvious surprise and a little delight. "You've some training, stop playing it down," And she moves in. The two finding their blades deflecting the other for the next few seconds. "I think I am having the very definition of 'dumb luck'?" Livino asks, as the pair continue to cross blades, and when he finds an opening, he moves to strike at her, even if it leaves him completely open to her attack again. The pair strike against each other as they part again, and he's already starting to give soft breaths of exertion. This isn't his usual exercise after all. "…uh. I think you still have the lead? I.. honestly think I've forgotten while lost in your eyes." he admits quietly, cheeks warm and bright with his boldness and exertion. Rossana's lips split into a grin and it proved she has dimples. It is brief before her expression is schooled again into focus. The blows exchanged their swords lift again. Maybe it was what he says about her eyes that distracts her, but he catches the arm with the Peony. The blade knocks the flower loose into the air and her blade goes skittering away. Arms spread open and she is looking at him with surprise and utter delight. "If you say beginner's luck, we'll have to go again," She warns him, as she begins to take off her helmet. The redness is still obvious in her cheeks, but she is smiling regardless. When the flower is knocked loose, Livino's eyes widen. Dropping the sword, he moves forward, his hand catching the delicate blossom before it manages to hit the ground. "..I think we have a lifetime to go again?" 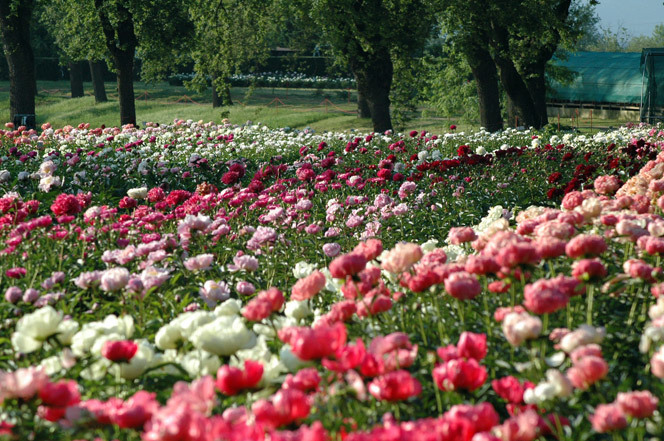 he asks with a lift of a brow as he moves to rise back to his full height to offer to return the peony back to her. His own smile mirrors hers, and if he could, he'd be totally toeing the ground at the moment. Rossana doesn't do something like drop her weapon, but does let one of the servants take it from her hand. It's an absent thing because Livino is right there with the flower. She takes it and tucks the flower into her hair, now slightly mussed in it's coiled braid, behind one ear. "I believe that you are right," She says with a nervous glance at the servants. They're doing that whole watching-not-watching thing. "I also think that you won the challenge…" A finger traces the peony's petals lightly. "I did." Livino responds as he wacthes the way she touches her petal, and he glances down. He actually does lick his lips in thought, before he lifts his eyes to hers and meets her eyes. "I do not wish to take something that you do not wish to give, Rossana." At least not in front of the servant/chaperones. The game of courtship and betrothal is a careful one. "When did you want to marry?" "Oh you take nothing I did not offer freely as a prize," Rossana says with a growing smile. Then, in a much softer voice, she says, "Soon. My dress is already being worked on." She briefly bites her lower lip, but the excitement and slight fear is in her eyes. "Shall we get out of these leathers and have something to eat and drink? We can talk about details…I had some thoughts." "Of course." Livino offers. Taking off his helmet, he considers for a moment and then steps up the smaller woman and his arms settle around her waist before lifting her, pressing his mouth against the side of hers in a soft and proper kiss - though it does not last long as to remain chaste. "I will see you at the dinner table."